The Patton Smartnode SN4112 Analog VoIP Gateways come in two models. One model features two FXO ports, the other models features two FXS ports. There is also a small form factor model, the SN4112S. 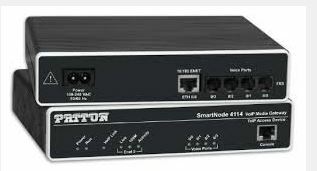 Patton’s SmartNode SN4110 Series delivers the legacy phone interfaces, service transparency, and flexible PSTN integration required for true converged packet voice. We stock these hugely popular 3CX compatible VoIP Gateways at discount pricing.